Efflorescence in concrete is a whitish coloured powdered deposition of salts on the concrete surface that is formed due to evaporation of water from the concrete. It is caused when water soluble salts are present in the concrete material, which comes on to the surface while evaporation of water from the concrete. 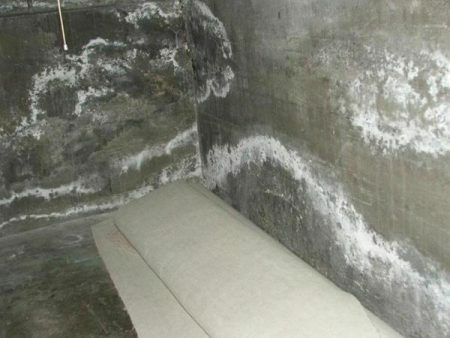 Fig 1: Efflorescence in concrete wall. The formation of efflorescence in concrete is factored by many external factors. Presence of salts in one of the materials of concrete. Commonly salts are found in the fine aggregate or sand taken from the river beds. If the concrete is not cured properly, the hydration process is incomplete on which the un-hydrated products near the surface form the efflorescence on the surface of concrete. If the water content in the concrete mix is more, it makes the concrete porous. Thus allowing the path for water and salts to come to the surface and for efflorescence. In wet conditions such as rainy season, the surplus water acts as a medium for the salts to transport to the surface of concrete and form crystalline white powder. Variability of concrete (compaction or curing) can result in localised problems where water can permeate more easily through the concrete. Inclusion of Class-F fly ash or metakaolin can lock up significant amounts of calcium hydroxide in the concrete. Installing vapour barrier to prevent the movement of moisture from the sub grade to the surface of a slab. Application of sealers and coatings can prevent surface water from penetrating slabs. Waterproofing agents to be used to reduce permeability of concrete. Making the concrete denser will reduce the permeability of concrete to a greater extent. Preventing the hardened concrete from exposure to moisture by maintaining surface sealers and site drainage, and from rising groundwater by placing a plastic membrane under slabs. Avoiding the concrete from premature drying. Use of concrete ingredient such as aggregate, cement and sand which contains very less amount of salts in it. Efflorescence in the concrete can be removed using the pressurised water jet. Applying pressurised water may dissolve efflorescence quickly. 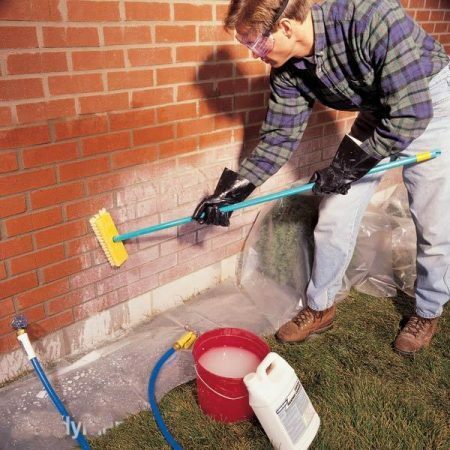 But care must be taken that the water after removing of efflorescence is completely dried off. If not dried, the same water can cause efflorescence to reappear. Fig 2: Removal of efflorescence using pressurised water. Some type of efflorescence that are easily removable can be easily removed using a stiff?bristle broom or brush. If the result is not satisfactory by dry brushing, scrub with clean water then lightly rinse the surface. Concentrated acid is not recommended to be applied on concrete, diluted proportion of 1:20 is used. the surface in which the acid is applied must be moist but without any free water. The applied solution should be allowed to react on the concrete surface for 10 to 15 minutes. The surface should then be thoroughly rinsed and scrubbed with lots of clean water. Repeat rinsing at least twice or until all traces of the acid solution have been removed. Fig 3: Removal of efflorescence using diluted acid and brush. Washing with acid may cause colour variations and alter the surface texture. For coloured finishes a more dilute acid solution (2% or 1 part acid to 50 parts water) may be required. A small trial area should be done first to assess the results. Proper safety to be followed while doing this procedure. Ensure good ventilation and avoid contact between the acid and the reinforcement. Rinse the building surface with water. If the surface is outdoors, you can use a hose to spray down the surface. Or, if the surface is indoors, you can use a spray bottle filled with water to rinse the surface thoroughly. Spray the cleaning solution onto the building surface and allow it to sit for several minutes. If necessary, you may need to apply multiple coats of the cleaning solution to the surface for optimal results. Rinse the building surface with water one last time. Then, use a fresh, dry cloth to clean the surface. Ensure the surface is dry to minimize the risk of ongoing efflorescence. Apply coatings roughly 1/8 in. to 1/4 in. below the surface of the building material. This will prevent water from evaporating and passing through the treated area as vapour and soluble salts.